New York, London – 25 July 2017 – Vela, an award-winning global leader in high performance trading, market data, and analytics technology, is pleased to announce that Damian Maguire, Senior Sales Engineer, won the Systems in the City award for Exceptional Customer Support and Vela received the award for Best High Performance Trading Solution. Now in its 14th year, the Systems in the City awards endorse suppliers of services and systems, to the regulated financial services sector, based on an independent and factual accreditation process. The winners were announced earlier this month during a gala luncheon in London. Over the last seven years, Damian Maguire has been responsible for providing client support during the pre-sales process and post implementation. 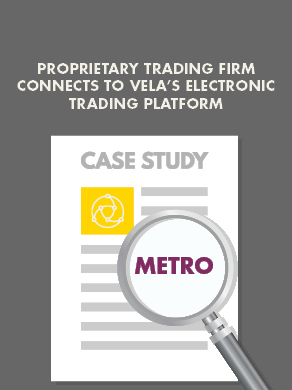 His extensive technical knowledge and expertise has gained the respect of Vela clients, providing them with much needed support in managing the complex world of market data and trading technology. Vela won the award for Best High Performance Trading Solution in recognition of its premier market data and trading technology. The award is the latest in a string of awards for Vela’s products and services, complementing the recent Intelligent Trading Technology award for Best High Performance Data Feed Handler – Software.